The perfect guest bed – our exclusive design allows the fold-a-bed to quickly and easily fold up for out of the way storage when not in use. This surprisingly light weight frame was engineered with stability and easy portability in mind. About poplar hardwood – the fold-a-bed frame is made of smooth, clean, unfinished poplar hardwood. The wood has been kiln dried and planed on 4 sides to be smooth to the touch. The wood takes stain or paint exceptionally well but most of our customers elect to leave it as is and enjoy the beauty of natural wood. Important notice – this item requires assembly, we include all hardware and step-by-step instructions. The Charleston Plus Platform Bed is crafted from Tulip Poplar and comes unfinished and chemical-free. 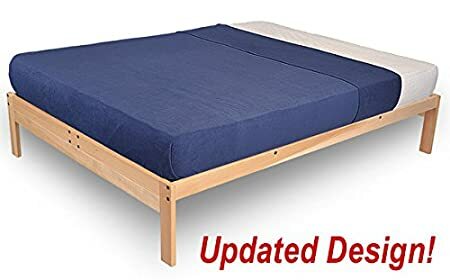 This bed features a slat spacing of under 3″ to accommodate your Memory Foam or Latex mattress requirements and eliminates the need for a box spring. Most of our customers choose to leave the wood unfinished, but we do provide finishing instructions for staining or painting. This bed is proudly made in the USA. Platform bed height is 15″. From floor to bottom of rail is 12″. The Charleston 2 Platform Bed is crafted from Tulip Poplar and comes unfinished and chemical-free. 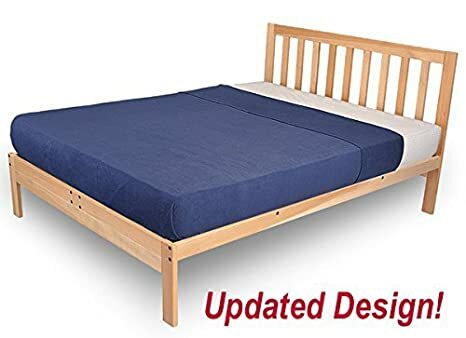 This bed features a slat spacing of under 4.5″ – if you need a slat spacing of under 3″ to accommodate your Memory Foam or Latex mattress requirements, please choose the “PLUS” version. Most of our customers choose to leave the wood unfinished, but we do provide finishing instructions for staining or painting. This bed is proudly made in the USA. Platform bed height is 15″. From floor to bottom of rail is 12″. The Nomad Plus Platform Bed is crafted from Tulip Poplar and comes unfinished and chemical-free. 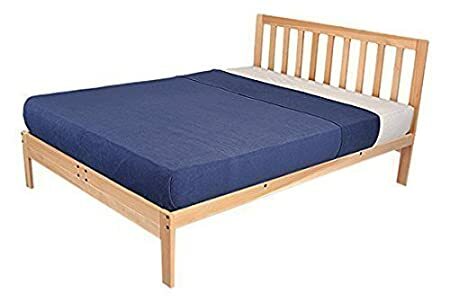 This bed features a slat spacing of under 3″ to accommodate your Memory Foam or Latex mattress requirements and eliminates the need for a box spring. Most of our customers choose to leave the wood unfinished, but we do provide finishing instructions for staining or painting. This bed is proudly made in the USA. Platform bed height is 15″. From floor to bottom of rail is 12″. 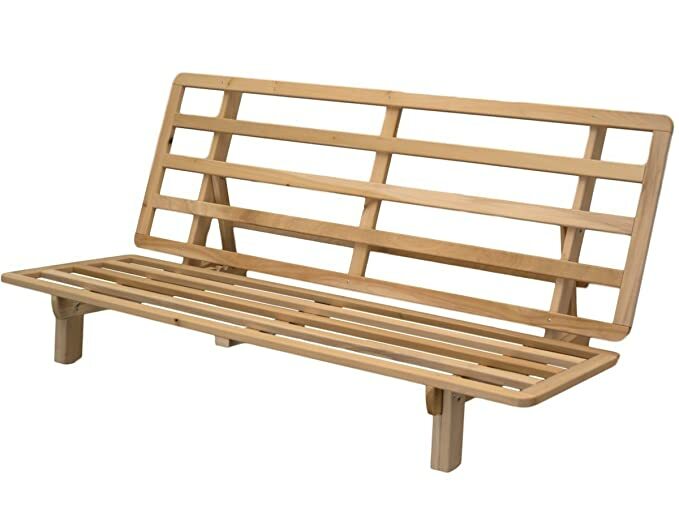 The Studio Bifold Futon Frame is crafted from Tulip Poplar, comes in a natural finish, and is chemical-free. Assembly is required. The Charleston Plus Platform Bed is crafted from Tulip Poplar and comes unfinished and chemical-free. This bed features a slat spacing of under 2.8″ to accommodate your Memory Foam or Latex mattress requirements. Most of our customers choose to leave the wood unfinished, but we do provide finishing instructions for staining or painting. This bed is proudly made in the USA. Platform bed height is 15″. From floor to bottom of rail is 12″. 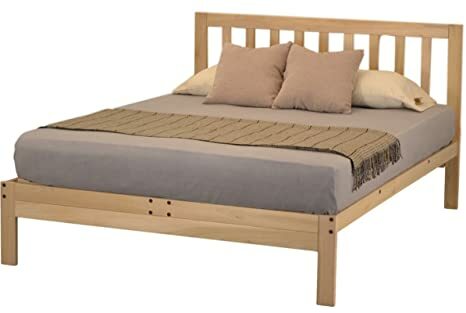 3991-CP-Q KD Frames Charleston Plus Platform Bed – Queen. 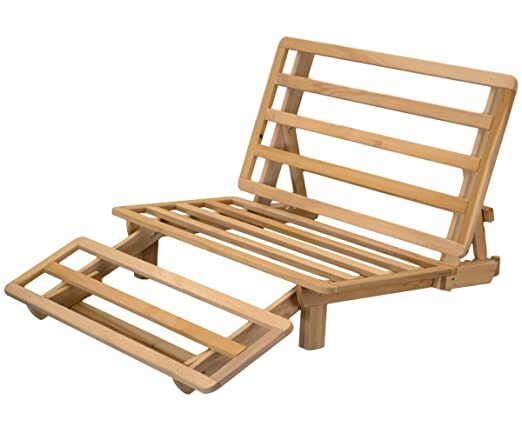 This item includes the Tri-Fold Lounger Bed solid hardwood frame only. (if you want a mattress and cover you will need to order them separately). LOUNGER+LOVESEAT+BED=TRI-FOLD – The Tri-Fold’s unique patented design allows an incredible thirteen different positions, including 8 lounge positions and 4 loveseat positions. The back angle can be set to any of four positions and the foot-rest has swing down legs so that it can be used in the foot-up or foot-down position, additionally the foot-rest section folds under out of the way when not in use. But that’s not all, the Tri-Fold also quickly and easily converts to a full size 10 inch high platform bed by simply folding the back down flat and raising the foot-rest. ABOUT POPLAR HARDWOOD – The Tri-Fold Lounger Bed frame is made of smooth, clean, unfinished poplar hardwood. The wood has been kiln dried and planed on 4 sides to be smooth to the touch. The wood takes stain or paint exceptionally well but most of our customers elect to leave it as is and enjoy the beauty of natural wood. IMPORTANT NOTICE – This item requires assembly, we include all hardware and step-by-step instructions. This frame works best when used with a FLEXIBLE futon mattress made to work with tri-fold frames. 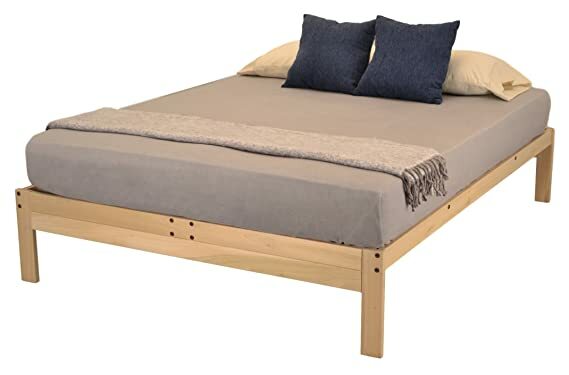 3481-C2-Q KD Frames Charleston 2 Platform Bed – Queen. The Fold-a-bed full size frame works with any standard full size mattress. THE PERFECT GUEST BED – Our exclusive design allows the Fold-a-bed to quickly and easily fold up for out of the way storage when not in use. This surprisingly light weight frame was engineered with stability and easy portability in mind. ABOUT POPLAR HARDWOOD – The Fold-a-bed frame is made of smooth, clean, unfinished poplar hardwood. The wood has been kiln dried and planed on 4 sides to be smooth to the touch. The wood takes stain or paint exceptionally well but most of our customers elect to leave it as is and enjoy the beauty of natural wood. IMPORTANT NOTICE – This item requires assembly, we include all hardware and step-by-step instructions. The Nomad 2 Platform Bed is crafted from Tulip Poplar and comes unfinished and chemical-free. This bed features a slat spacing of under 4.5″, for a slat spacing under 3” to accommodate your Memory Foam or Latex mattress requirements please choose the “Plus” version. Most of our customers choose to leave the wood unfinished, but we do provide finishing instructions for staining or painting. This bed is proudly made in the USA. Platform bed height is 15″. From floor to bottom of rail is 12″.